In my free time, I am developing electronic circuits and (mostly free) software some of which can be found here. I recently also started publishing some content related to model making -- and there is a lot more to come! So, stay tuned. Concerning electronics, I love digital circuits, programmable logic devices and microcontrollers, see the programmable devices section. Furthermore, there are boards which connect to a PC via the USB port (USB8bit, USB-FX2) which supersede my very old parallel port card (Latch16bit). Some of my computer-generated films and images are also available here, together with more utils, libraries and information - just feel free to surf around. STM32: Programming STM32 F2, F4 ARMs under Linux: A Tutorial from Scratch. USB: FX2 & EEPROM extended to cover pitfalls. 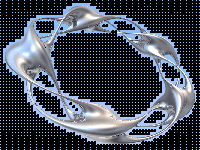 New version 0.47 of CYCFX2Prog FX2 programming software. 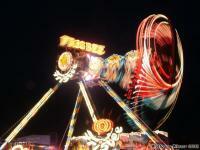 Finally: Long exposure images of Oktoberfest 2008. USB: Programming an EEPROM attached to the FX2. New version of CYCFX2Prog FX2 programming software. Added advanced examples for the FX2. New version of FX2Pipe USB software. New version of USB-AtmelPrg software. Getting started with AVR32 development. Updated USB-FX2 software to fix some bugs. More art added (e.g. Wummy). New software and firmware for USB-AtmelPrg. Added model making section; stay tuned for more! Restructured and extended: Programmable Devices. Creating time-lapse movies: Speed things up! Fun with Google translate: German/English. FX2Pipe: Fast IO program for USB-FX2 board. USB Live Oscilloscope: Dual 8bit, 10MS/s. 3.3V level converter for USB-AtmelPrg. USB-AtmelPrg: Flash CPLDs via JTAG & SVF. 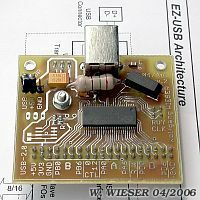 USB-FX2: USB-2.0 high speed interface board. Maintainance updates of QTXlib, QTX-Burn, ElStat. Rigid body MD sim: Low-speed impacts. High-speed photos of low-speed impacts. Ising model simulator experiment code released. Digital white noise source design published. Restructured electronics; new design info page. Small but useful: History image viewer released. Electrostatic simulation (Laplace PDE) with GUI. Easy-to-use USB interface: USB8Bit board. Small footprint 10kHz-30MHz square wave oscillator. Complete frequency counter design published. In-system AVR RISC programming (via SPI). Real 3d: Creating stereo images. 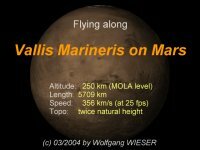 Flying along Vallis Marineris on Mars. The 4 largest volcanos on Mars rendered. POVRay isosurface accuracy improvement patch. Mars robot landing sites rendered. More advanced AVR programmer supply circuit. AVR programmer software applying a critical bugfix. PRT patch: Progressive refinement for POVRay. Fast (QTX-) Burn simulation (source code) published. Shaney text composer made available. New revision 3 of Latch16bit board circuit. Updated software for Latch16bit and AVR programmer. 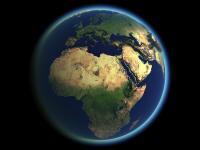 Rendered images of Earth and Mars. This home page goes online.